We have a soft spot in my heart for scones because they were one of my mother's favorite treats. we will admit, though, that we considered them not sweet enough for my childhood palate. My mother liked her sweets not overly sweet and that was strange to me. But I grew into an adult that also doesn't like her sweets overly sweet. Scones really are perfect for us. We tend to think of them as a British food but, considering how diverse the British empire once was, scones have probably found their way to many corners of the world. One of my favorite versions, especially around the holidays, is the combination of cranberry and orange. But pomegranates figure heavily in Middle Eastern cuisine and they're in full season right now. The two flavors are easily combined in a sauce so why not in a scone. Orange would be delicious but we changed it up a little by going with lemon zest instead. It adds a subtle bright citrus note that I really liked. Another reason we like scones so much? They're so easy and fast to make so I can whip up a batch for breakfast anytime. Enjoy! Add the all purpose flour, baking powder, salt, sugar and chilled butter to a food processor. Pulse a few times, just until the mixture resembles course crumbs. Alternately, you can do this in a bowl using a fork or pastry cutter. In a separate bowl, whisk together the lemon zest, eggs and cream. Pour into flour and butter mixture and pulse just until combined. Do not over-mix. Fold in the cranberries. 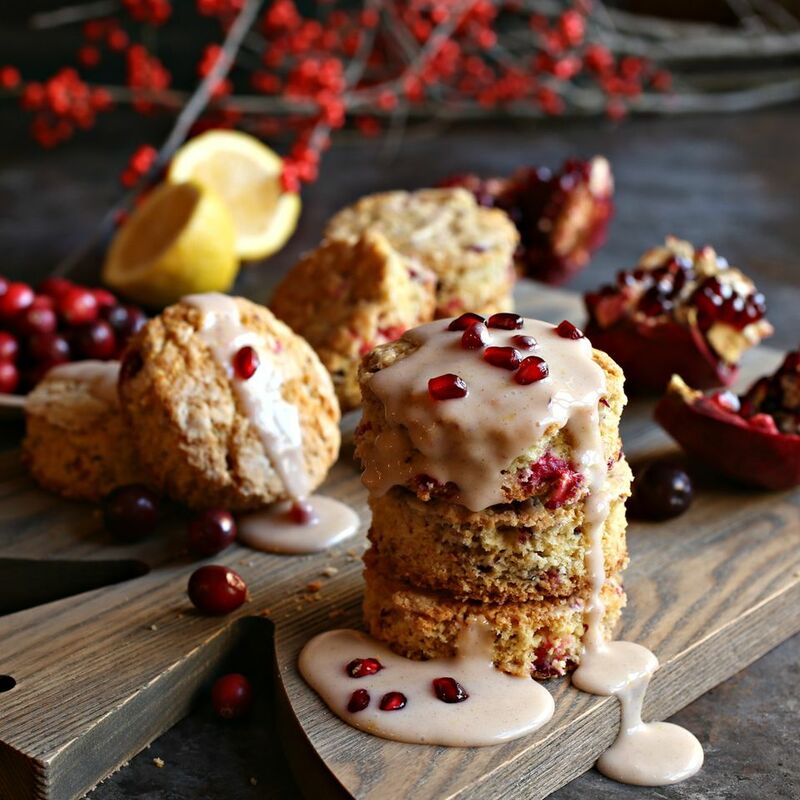 Note that if you first toss the cranberries with a tablespoon of flour, it will prevent them from sinking to the bottom of the scones. Turn the dough out onto a well floured board and roll to about an inch thickness. Using a round or square cutter (approx. 3"), cut out the scones. Place the scones on a baking sheet lined with parchment paper and bake in the pre-heated oven for approximately 20 minutes. To make the pomegranate glaze, add the powdered sugar, milk, pomegranate juice and pinch of salt to a bowl and whisk until smooth. Pour over the cooled scones.